You know what? When it comes to fan work there is an unfair balance between the ratio done as homages to heroes and the amount down as validation of their villains. Sure you can Batman your ceiling roof, but wouldn't you rather Fing Fang Foom it? One person seeking to right this wrong of wrongs is 'Natetheknife', who crafted (and I mean crafted) this fully functional M.O.D.O.K. puppet from papier-mache, paper clay, joint compound and acrylic paint. 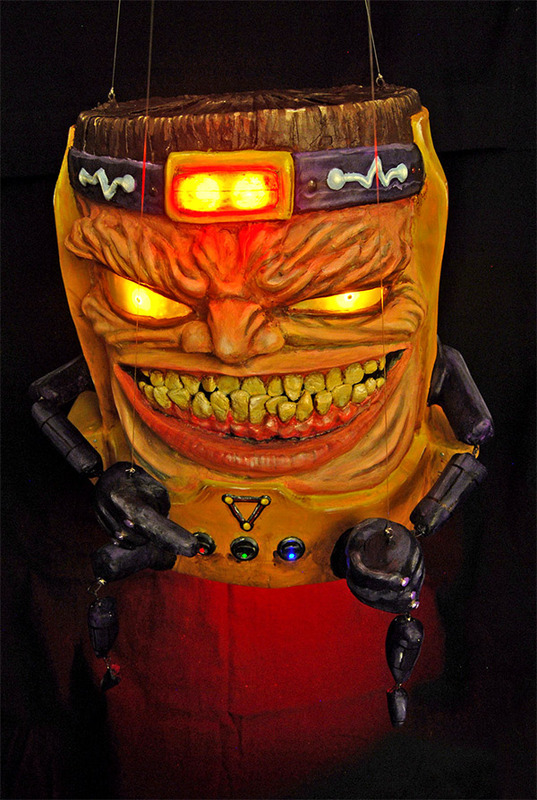 Done as a 3D design class asignment, if you add in the fact the fiend features radiant LED buttons and eyes, Marvel's master manipulator seems to stare right into your soul! What do you think? For more shots of this top-of-the-class piece of work, including its LED engine thruster bottom, click the jump. Wow! That's just all sorts of creepy, but in a good way. Nice to see ol' Tater-Head has his share of fans. Damn this is a pretty cool-looking puppet. And it has LED lights too you say? Sweet. Hey Comicsfan - welcome to IADW! I thought the same thing, but you can just picture it can't you... 'Hi class, this is my M.O.D.O.K.' (Crickets churp and tumbleweeds blow through in silence). Glad you liked the title Dave, was pretty chuffed with it myself! Dale - I'm sure the dude would sell it too you for a good price. You know your collection of characters isn't complete without it mate! Saw this in one of your "might also like" plugins... He's a favorite of mine so I had to see it! That is pure NIGHTMARE FUEL! I want to see it in action! It sure is King - beats the puppets we had to craft at school thats for sure. Clay always ended up more of a projectile across the classroom in a food-fight fashion, but hey, war is a classroom to. Just ask Cable.